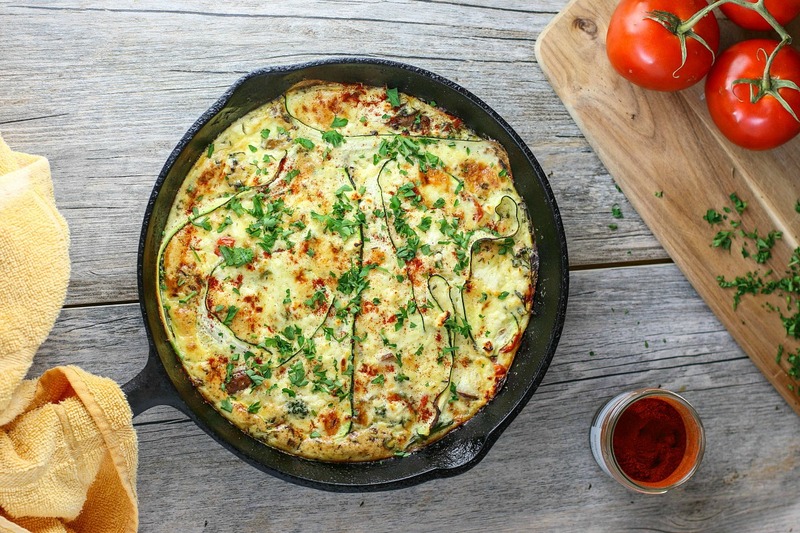 Is it a quiche or a frittata? I’ve asked myself this question several times. Typically a quiche is identified by a crust — but a frittata doesn’t call for cream or milk; this bad boy is crustless, but contains milk. So, is it both? Neither? What I *do* know is that this veggie-filled egg concoction is flippin’ delicious and nutritious, so in the end, who cares what we call it. I was thrilled when my friends Mike and Susan brought me a carton of chicken eggs from their very own coop. I keep bugging my husband to agree to move out to Pittsboro, NC near our farming pals so that I can grow a lush vegetable garden and we can all just live off the land; we can work off of a bartering system. Of course, my husband thinks I’m kidding. I couldn’t possibly use these beauty eggs for a simple scramble. I wanted to make them shine — and what better way than with a nourishing quiche? The holidays are around the corner, brunches are in order, and quiche is the perfect go-to for any late morning affair. It’s also super satisfying if you’re hankering breakfast for dinner. Seriously. You can eat this all day, every day. The types of vegetables used in this recipe are flexible. I went for a medley of broccolini, leeks, zucchini, grape tomatoes and baby bella mushrooms. If you like a bit of heat, add some diced jalapeño to the mix. For cheese, I used part mozzarella and part crumbled feta which added a nice little tang. On my last produce run at Whole Foods, I came across this gorgeous mix of crunchy adzuki, lentil and pea sprouts. I knew I had to have them, mainly because I knew they’d photograph well. #FoodBloggerPriorities. But, it just so happens they make an excellent addition to quiche! Because I’m a cheeseball and like to get fancy shmancy, I arranged my ribboned quiche in waves + spirals. It looks ridiculous prior to cooking, but trust me. It’s hella pretty when it comes out of the oven. Now. If you have concerns about a quiche with no crust, I promise you this stuff is delish. Also, as the eggs + cheese cook, they create their own hardened crust against the pan; you still totally get that crispy goodness. Fluffy eggs and cheese create their own crust in this tasty veggie-filled quiche. It's a perfect brunch option, but you could eat this anytime of day. Who doesn't love a little breakfast for dinner once in a while? Pre-heat oven to 350 degrees C.
Heat olive oil in a pan over moderate heat. Add the garlic and leeks; simmer until fragrant - about 2 minutes. Stir often to prevent the garlic from browning. Add the mushrooms, grape tomatoes and broccolini; simmer until mushroom and broccolini are tender - about 5-7 minutes. In a large bowl, whisk eggs until completely beaten. Add milk, sage, thyme, salt and pepper, and whisk to combine. Finally, add both the mozzarella and feta cheese. Transfer your cooked vegetables to a 9x9 cast iron skillet or a cooking vessel with similar dimensions. If using diced jalapeños and/or crunchy sprouts, sprinkle them over the vegetables. Pour in the egg mixture and stir. Finally, place the zucchini ribbons into the pan upright, twisting and twirling them a bit (as pictured in post). This may seem odd at the time, but it looks super pretty once the quiche is cooked. Bake in the oven for approx. 30 minutes or until the egg is cooked through. You can test it with a cake tester. Once ready, remove from oven and let it stand for 10 minutes before cutting into it. Garnish with fresh parsley and paprika. This recipe is super adaptable, so get creative and use your fave veggies. Lemme get the usual out of the way here first - awesome ingredients, great combination, very well thought out. Seriously it sounds taaaaasty. Now to move on to the stuff I REALLY want to say. 1. LOVE the ribboned zucchini. I dunno why, but it just does something to this dish that I really like. Plus I feel like thin zucchini is generally more enjoyable in egg dishes than big chunks - it avoids creating those watery little veggie pockets. 2. #FoodBloggerPriorities - good lord yes. I can't help myself. I see something adorable and photogenic and it's like "Well now, I just have to work that into a recipe." I have a feeling that's part of how trends get started in the food world - everyone knows that it's just going to look so damned good, so everyone jumps on board. And man, those sprouts are seriously trend-worthy. 3. Yay for farm-fresh eggs, and yay for dreams of country living. Ideally with chickens roaming around the yard. Y'know, for more awesome eggs. 4. Quitatta? Fruiche? Whatever. Looks awesome. Cheers. I love the look of the zucchini in ribbons! This dish looks like a wonderful way to welcome 2017! Thanks, Mardi! I'm ready to eat all the vegetables myself, so I'll probably be whipping another one of these up soon. After these last two weeks, I don't want to look at another hunk of cheese or glass of wine! (We'll see how long that lasts; I give it two days, ha.) Oh, the holidays. Thanks, Gabby! Yeah, the only reason I do look into proper names is to avoid misleading people and for SEO, though I'm not sure how much it even matters. It's delicious, good enough, right? Right :) And oh boy, yes. I love knowing that my eggs are coming from a humane farm. I can sleep at night. Haha. This is one of my fave dishes to make, whatever you call it :-) I love how you packed it with veggies and cheese. I need this right now :-) Yum. Thanks, Colleen! Anything that cleans out my crisper is a winner in my books. Oh I love this! I am so excited about making things in my skillet and I'm about to start Whole30 so this quiche is a perfect meal! Ha, I didn't know that frittata doesn't have milk/cream. I very often make "crustless quiche" and call it frittata. Today I learned something new. Your #foodbloggerpriorities sounds very suspiciously like mine :) I once bought a jar of mustard because the jar was really pretty. Sadly, hubby threw out the jar when the mustard was finished. I had to buy it again :) your which looks amazing! I love all the veggies and jalapeño and I am totally going to steal this idea of using long/unchopped pieces of veg!! looks so delicious and fresh! I'll definitely try this recipe!! Thanks, Kelly! It's definitely scrumptious.